Play More B'More | KaBOOM! Play More B'More creates playspaces that make it easier for kids to get the play they need to thrive in Baltimore. Through multi-sector partnerships, we are increasing access to play in some of Baltimore’s most challenged neighborhoods and engaging key city stakeholders to help make play an easy choice for families in Baltimore. Create great places to play where they are needed most. Foster relationships with city agencies to build strong, safe places to play in Baltimore neighborhoods. KaBOOM! leads this initiative in partnership with the Annie E. Casey Foundation, The CarMax Foundation, Mayor Pugh and the City of Baltimore, Baltimore City Public Schools, Baltimore Corps, business leaders and youth serving organizations across Baltimore City. Through these partnerships, we are building kid-friendly communities that make it as easy as possible for all kids to get the play they deserve. Baltimore City leadership, the private sector, the philanthropic community, and child serving community organizations are all coming together to address the city's toughest challenges by prioritizing the needs of kids and families. Through the Play More B'More initiative, Baltimore is at the forefront, taking action to make it as easy as possible for all kids, particularly kids growing up in poverty, to get the play they need to thrive. It is a powerful example for other cities to follow. —James Siegal, President of KaBOOM! The Play More B'More playground builds are part of a $5 million partnership with The CarMax Foundation to build 33 playgrounds and donate 46 signature play products, Imagination Playgrounds and Rigamajig, with KaBOOM! across the United States by the end of 2018, providing more than 300,000 kids the joyful childhood they deserve. "CarMax is committed to making a difference in the Baltimore community and supporting countless families by helping get kids moving and playing," said Craig Cronheim, president of The CarMax Foundation. "We are excited to work with KaBOOM! and local organizations to have a sustained impact in Baltimore." 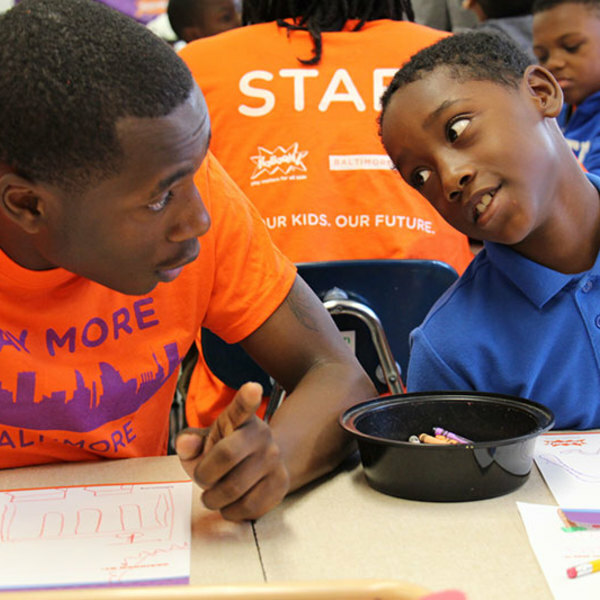 Baltimore Corps works to make Baltimore the social change capital of America. They believe that by empowering today's visionaries alongside tomorrow's generation of leaders, they can build a stronger city and much more. By connecting, developing and retaining talent in the city, Baltimore Corps works to create increased opportunities for Baltimore's children and families. 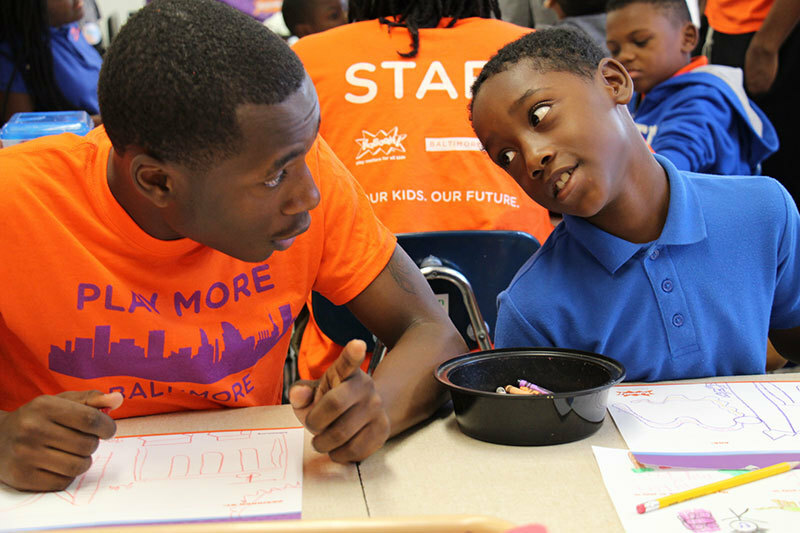 Since 1991, Family League of Baltimore has mobilized resources, empowered communities, and built the capacity of organizations to provide children and families with high quality programs and services that help them reach their full potential. Family League of Baltimore uses thier deep experience in resource management to collaborate with stakeholders to improve opportunities across the city. Their goal is that by 2030, all children in Baltimore will be born healthy, succeed academically, graduate high school and transition into higher education and the workforce. The Annie E. Casey Foundation creates a brighter future for the nation's children by developing solutions to strengthen families, build paths to economic opportunity and transform struggling communities into safer and healthier places to live, work and grow. For more information, visit www.aecf.org. Baltimore City Public Schools, OneBaltimore, Playworld, DAP Products, Morgan Stanley, Baltimore Gas and Electric and LifeBridge Health.